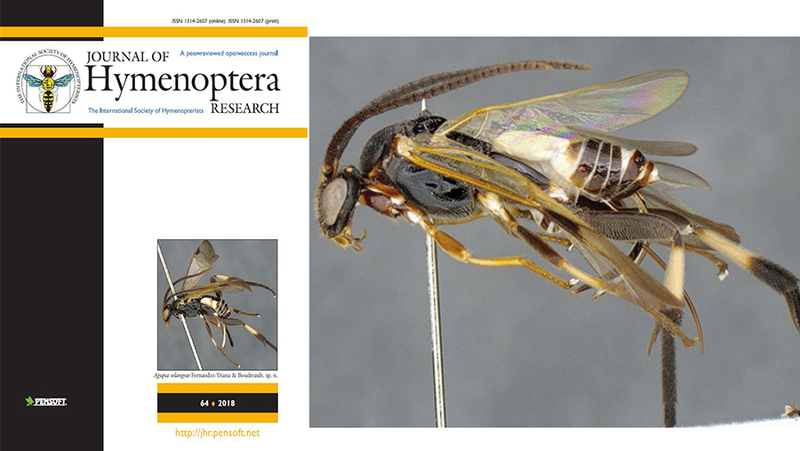 A myriad of species and genera new to science, including economically important wasps drawing immediate attention because of their amusing names and remarkable physical characters, in addition to work set to lay the foundations for future taxonomic and conservation research, together comprise the latest 64th issue of Journal of Hymenoptera Research (JHR). Two genera (Qrocodiledundee and Tobleronius) named after the action comedy Crocodile Dundee and the chocolate brand Toblerone are only a couple of the 14 new genera from the monograph of the microgastrine wasps of the world’s tropical regions, authored by Dr Jose Fernandez-Triana and Caroline Boudreault of the Canadian National Collection of insects in Ottawa. In their article, the team also describes a total of 29 new species, where five of them carry the names of institutions holding some of the most outstanding wasp collections. Another curiously named species of microgastrine wasp described in the new JHR issue, is called Eadya daenerys in reference to Daenerys Targaryen, a fictional character known from the best-selling book series A Song of Ice and Fire by George R. R. Martin, and the blockbuster TV show Game of Thrones. Discovered by University of Central Florida‘s Ryan Ridenbaugh, Erin Barbeau and Dr Barbara Sharanowski as a result of a collaboration between biocontrol researchers and taxonomists, the new species might not be in control of three dragons, nor a ruler or protector of whole nations. However, by being a potential biocontrol agent against a particular group of leaf beetle pests, it could spare the lives of many eucalyptus plantations around the world. Furthermore, a wasp named Dolichogenidea xenomorph, which parasitises other eucalyptus pests, is also named after a character from a sought-after franchise. The scriptwriters of the horror sci-fi movie series Alien are thought to have been thinking of parasitic wasps when they came up with the character Xenomorph, remind authors Erinn Fagan-Jeffries, Dr Steven Cooper and Dr Andrew Austin. Additionally, the team from University of Adelaide and the South Australian Museum point out that the species name translates to ‘strange form’ in Greek, which perfectly suits the characteristic remarkably long ovipositor of the new wasp. In another paper of the same journal issue, Dr. Jean-Luc Boevé, Royal Belgian Institute of Natural Sciences, Diego Domínguez, Universidad Técnica Particular de Loja, Ecuador, and Dr David Smith, Smithsonian’s National Museum of Natural History, USA, publish an illustrated list of the wasp-related sawflies, which they collected from northern Ecuador a few years ago. They also provide a checklist of the country’s species. Tomanovic, University of Belgrade, studies ways to extract DNA from dry parasitoid wasps from the natural history archives decades after their preservation. In their work, they make it clear that such projects are of great importance for future taxonomic and conservation research, as well as agriculture. The open access Journal of Hymenoptera Research is published bimonthly by the scholarly publisher Pensoft on behalf of the International Society of Hymenopterists.